…and today I am thankful for that. Yes I am! Truly grateful because it wasn’t on purpose. If you read my past blog posts I have been on a roller coaster weight ride in the past year. I’m not where I used to be because I swore i’d never cross a certain threshold again; I’ve stayed true to that <insert fist bumps…I thank you>. But the weight has fluctuated. I weigh more than I did this time last year (with determination to be back by the end of the year), but I found reason to celebrate. I have a pair of pants I purchased earlier this year. Fit me really well. By summer, my thighs were not having it. Truth be told, my thighs nor my waist! So all summer this pair of pants sat in my closet with a smirk on its face. Buster. Well look who’s getting the last laugh…Ha! [Yeah, I talk to myself and to my clothes. No, I am not crazy – you do have to encourage yourself at times.] Soon they will be too big, I hope. Other good news…glucose level is down. I’m serious about that one. I will be off the meds in 2016. And, come Friday, I will begin my marathon training again. I’m going to take it slow. Thinking about running the 1/2 marathon in Chicago next year. Help me! Seriously…somebody help me!!! The struggle continues to be real! My road to health has to take a serious path. God granted me a stay and allowed me to fight a life-threatening, life-altering disease and win! As a friend shared with me, life is to short to take it for granted. It’s why he began to take care of his temple, no excuses. I join in the sentiment. Life is way too short…and what a wonderful life I am living. Yes, it will be even more wonderful when i shed a chunk more lbs. P.S. Join me in November for my 30 Days of Thanks. Daily, post what you are thankful for. 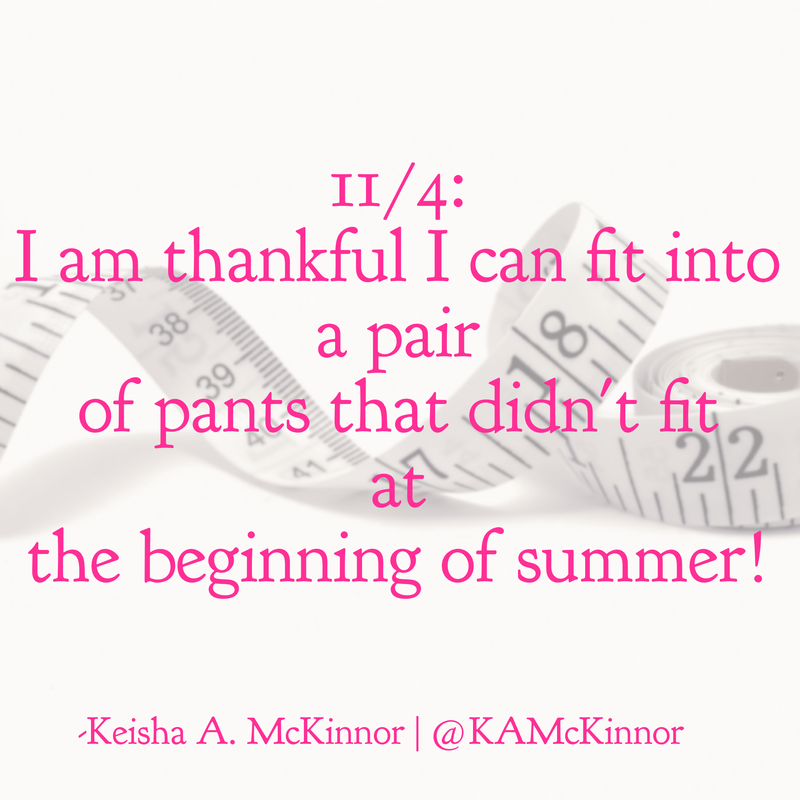 Follow me on Instagram & Twitter: @kamckinnor to read mine. Below is my Instagram pic for today. Yep, I am so happy to get into those pants. Plus they are black…makes me look even more slimmer. LOLOL! …will be days I never forget. What does it mean to see “The Light?” That term is often denoted when we have a “eureka” or “aha” moment. That point in time when clarity about a thing, person, situation or decision is formed. I have eureka moments often, but for today’s purpose, I mean the bright, white light that is often seen by those who are about to transcend to the heavens….that light when God begins revelation in one’s life…my life. Today is October 15th and we are half-way through Breast Cancer Awareness Month. As I reflect, I am thankful for a lot of things, #1 I’M ALIVE! My reflection also brings me to a dark time during my cancer journey when I gave up. The disease and treatment was taking a toll on my body. I literally gave up – physically, mentally and spiritually. I asked God to please watch over my child and give my family the means and strength to raise him. I was done. As I sat in a wheelchair in a CT room waiting to be scanned I began to drift. The hustle and bustle of hospital noise became distant yet The Light became brighter and brighter. In the distance I saw the form of Christ himself standing there with a broken chain in his hand. He didn’t move nor did He say a word. My eyes went from Him, to the chain and back to Him. At that point my eyes popped open and all the hospital noise filled my ear. Nearly four years ago to the date The Light is just as visible as the day I saw it. It was then I knew it was not my time and it is now I am reminded of my purpose. To my Survivor Sisters, I STAND WITH YOU. To my sisters currently fighting the fight, I SUPPORT YOU. To those that have succumbed to cancer I HONOR YOU. To the caregivers, I ADMIRE YOU. …where for art thou Motivation? Oy, where do I begin. Or should I say where has my motivation gone? I was doing so well discovering myself, working out, eating decent. I’m still fulfilling the first of those three but the latter two, I don’t know what happened. Every day I get up with the intent on it being the day I get it together. Then every night I say “tomorrow.” With that said…TODAY will be the day. For real. Again. For real, for real. Discovering myself: Exciting news is coming on this front. As soon as I am released to reveal it, you all will be the first to know. Ooh, I can’t wait to share the good news! Working out: Since I’m not working I had to let go of my gym membership, for now. And, given that it is hot as hades in Phoenix right now, outdoor workouts for this girl is out of the question. Out of the question I say. Thus, I need indoor, at home workouts that will be fun and keep my attention. Suggestions please. (I need a trainer, but since I can’t afford one, it’s just me and my rottie). BTW, I still dream of running that 1/2 marathon one day. Eating decent: I say decent because I don’t think I have the desire to eat healthy all day every day. That’s boring to me. I’ve shifted in my eating whereby I rarely eat breakfast, not eating until lunch time or after. I know I need to change that. I do believe eating breakfast and lunch and a light dinner was the right combo for me. Again, I’m back on it. Breast Cancer Awareness month is coming up! Show some love by signing up for a walk, hold a fundraiser to donate to finding a cure or volunteer to help a survivor or caretaker in need. No deed is ever to small. I will always be grateful for those that took care of me: family, friends, co-workers, pastors, medical staff and strangers. I just found my motivation. If I don’t do it for me, I at least need to do it for those who cared enough to make me comfortable and not want to see me suffer nor leave this earth. Thank you Holy Spirit for pouring that into me!